Enjoy leaving for work guilt- and stress-free and coming home to a calm, relaxed dog, intact home, and happy neighbors. Let me help you connect the dots between Point A & Point B so you can leave your dog home alone without stress, guilt, or worry. It really is possible. 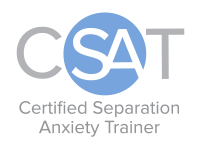 Separation Anxiety training is done 100% remotely for clients anywhere in the world! The marvels of modern technology allow us to train in the comfort of your own home, keeping the setting as natural as possible to optimize your dog’s success. I’ll create a customized training program for your dog, setting daily goals to maximize your dog’s progress by providing step-by-step support for you all along the way. Anxiety is experienced differently for each individual organism, and response rates to modification of fear and anxiety-based behaviors vary from dog to dog and case to case. Additionally, results tend to follow a snowball curve—slow at the outset then gaining speed with time. For these reasons, I require an initial 4-week commitment when tackling separation anxiety. This gives us enough time to attain measurable progress and relief, assess your dog’s learning curve, and more accurately determine the length of training required to meet your home alone goals for your dog. You may decide at the end of your initial month of training to use the knowledge and skills you’ve acquired to continue forward progress on your own, or I will be happy to continue to support and assist you. Call or email me to set up Initial Consult today. Why is this happening? Will it go away? Separation anxiety is just that—anxiety. It’s an anxiety disorder, to be more precise. Your dog isn’t trying to be naughty. She’s truly panicked at being left alone, and all the resulting behavior—barking, whining, chewing around exits, self-mutilation (excessive licking or chewing on herself), even the bladder/bowel evacuations—are beyond her control. Some dogs are born nervous or have a genetic predisposition toward anxiety. These dogs are more susceptible to separation anxiety, though confident dogs can fall prey as well. Generally SA is triggered by a difficult change or trauma. Common causes are a household move, being rehomed, losing a family member (such as through divorce), a schedule change (such as mom going to work when she used to work from home), or a traumatic experience such as a burglary or a construction worker harassing a dog while she’s alone in the home. Will it eventually go away? Unfortunately, no. Just as with us humans, anxieties rarely diminish on their own. Left untreated, separation anxiety tends to grow worse. How about if I get another dog to keep my dog company? Sadly this very rarely works. Most dogs experience separation anxiety from their people. Bringing in a new dog risks complicating the situation rather than solving it. The good news is that separation anxiety can be changed. Anxious dogs can learn to be alone again without fear. But it isn’t a quick process and it does require a commitment to seeing a careful training plan all the way through. My job is to make that process as smooth and achievable for you as possible. "Anxious dogs can learn to be alone again without fear. But it isn’t a quick process and it does require a commitment to seeing a careful training plan all the way through." Melanie’s specialization in behavior issues stems from her scientific interest in the canine brain combined with her desire to make clients’ and dogs’ lives better.